If you have this two Apple products, Apple Watch and Airpods, then you would like this new design case. Charging dock is made by classic black soft silicone, durable, sturdy and can hold your apple watch and airpods securely and stably. 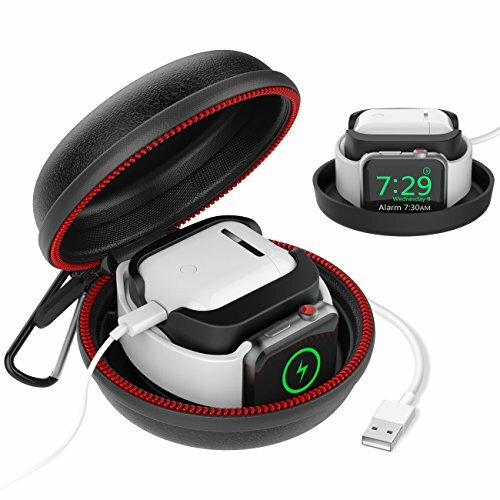 Protect your watch from scratches while traveling, going to the gym, or storing away at home with the travel watch case; Charge Apple watch and Airpods at the same time in one place - sturdy, neatly and organized. Apple Watch, Airpods, Airpods Charging Case, Original Magnetic Charging Cable are NOT Included. ✔ Multi Function Apple Watch Dock: fits for all sizes and models of apple watch (38mm/42mm) series 3 / series 2 / series 1 /nike+ and apple wireless airpods charging case, charging at the same time and save space.